So, who am I? Tomas is my name, 46 is my age, and wine is my main hobby. When i started this blog in 2010 I was living and working in Brussels, Belgium, but in early 2012 I returned to my more permanent home of Stockholm, Sweden. Four years in Belgium, which unlike Sweden has a free market for wine rather than a monopoly, has definitely influenced my outlook as a wine drinker. I’m active in a large Swedish wine tasting association known as “Munskänkarna” (the literal translation is apparently “cup-bearer” if that makes you any wiser), which also has a fairly active chapter among the Swedish expats in Brussels. I was the course coordinator for our chapter there until i returned to Sweden, and now I arrange some classes in the Stockholm chapter. In 2007, I passed the “level 2” examination of this association – a fact which probably tells most of you nothing, but “roughly equivalent to WSET Advanced Certificate” might do. 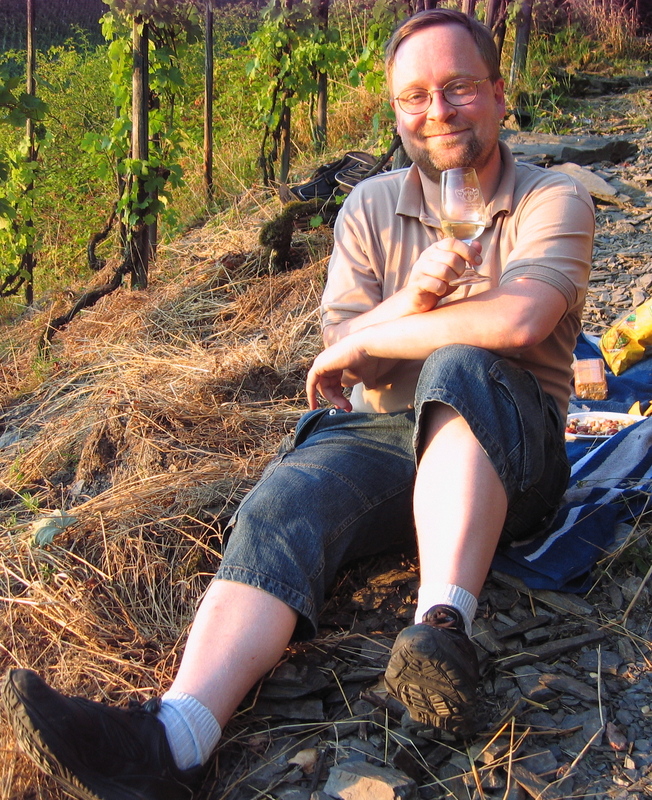 I passed the “level 3” theoretical and practical tests in 2008 & 2009 – that’s the highest level and should correspond to WSET Diploma – but I must get around to writing a paper before I’ve actually past the examination at this level. I sometimes also taste wine in two other wine tasting clubs: AuZone in Stockholm and formerly CAV in Brussels. Off and on I’m fairly active as a Wikipedian, and a member of English Wikipedia’s WikiProject Wine, although I’ve not been too active in that project in recent times. I try to keep two different language versions of this blog – English and Swedish. My level of activity in English is somewhat varying, and I add material a bit more regularly to the Swedish version at vintomas.wordpress.com. (Those posts from the last couple of years that haven’t been translated are usually about Sweden-specific stuff, such as rants about our alcohol monopoly or what our politicians say about the monopoly or alcohol tax.) Most of my blog posts are about tastings of several wines, sometimes with some additional reflections, and a short post with just a tasting note of one or two wines is very rare. When I like to write tasting notes on one or two wines without too much additional comments, I usually put them on Cellartracker instead. My account is called vintomas, and here you can see an overview of the tasting notes I’ve added. If you wish to contact me you could send mail to my g,m-a i,l address (remove the non-letter characters and you should get the idea) where I’m tomas dot eson, or write a comment to a blog post and mention that you want me to call you back. Tomas: I like your blog. You are a thirsty fellow with good taste! Well, whenever I taste a DRC wine or a Musigny from De Vogüé, I write a blog post. And often that’s tastings where we get 4-6 cl of each wine. If I just pop a bottle of basic Bourgogne rouge or an NZ Pinot at home, I usually don’t blog about it, but sometimes I add a tasting note to Cellartracker. The price level you indicate should buy you really good village-level wine or some premier crus from producers that are very good but are not “cult”. I’m assuming red Burgundies here, and I don’t really know who stocks them in the UK. If you’re into more elegance, Volnay or Chambolle-Musigny are good villages. Some favourites are Ghislaine Barthod (Chambolle), Pousse d’Or (Volnay) or Lafarge (Volnay), although some of their wines will be somewhat over your limit. If you want a bit more spice and tannin, perhaps Dupont-Tisserandot from Gevrey-Chambertin. A domaine with vines a bit all over the place is Vougeraie. Also, many of the big négociants are good today – Joseph Drouhin, Bouchard Père & Fils, Louis Jadot – and there are small good négociants as well, such as Alex Gambal. Not all of these are in the same style, but I like them. Finally, I think you should also check out New Zealand Pinot Noirs, since they are the most European of the New World Pinots. Your budget should buy you wines from the best NZ producer, Felton Road. Why not check out Ata Rangi as well. Happy hunting! Thanks, I’ll have a look at that, although it may take a couple of weeks before I get around to it. I’ve also considered to include segments of the beautiful Larmat map from 1944 (which exists digitized) for those villages that are illustrated in detail. Correct, it’s not finished. I’ve had a slow rate the last couple of months, so I’m not sure I finish this year. Tomas! It’s Agne27 from Wikipedia! I just stumbled across your blog while looking up info on obscure villages in Champagne. Great stuff! Enjoy reading you blog. Just back from a long weekend in Epernay. The highlight was a visit to a very small producer in Dizy called Guy Brunot. Exceptional champagne and incredible value! Tomas, a pleasure to read. Do you déguste brandy? Your thoroughness is exceptional (Guigal Ampuis), and I was hoping you may have happened upon a cognac-esque eau de vie from Greece called Aen; certainly a cognac in taste though I’m not confident its only press is from grapes. I had the privilege of tasting alongside Louis XIII and was absolutely blown away…as was the XIII, which isn’t taken lightly! A solera system from 1888 from the house of Metaxa, 2008 was the first release. Nowhere to be found on CellarTracker, surprisingly. If you find the time to seek it out and the opportunity to report your experience, we readers would be benefactors of your pointed skillset. Cheers.